First off, I think that Mark Brooks’ cover for the issue deserves a special mention. While extremely packed, it does show off a lot of heroes and its great to see the diversity in the team here, which isn’t something that you’d normally see in a team book from either Marvel or DC, what with the over-the-top focus on white dudes. This cover is different and it is the start of something great I think. With the story, we start off with Captain Britain and Agent Wisdom of MI:13 investigating an attack by the Psycho-Wraiths near Canary Wharf in London. The two quickly determine that the evil mystical organisation known as Mys-Tech must be back and on a resurgence of its own, given that this is the third such attack of the Psycho-Wraiths in twenty-four hours. Matters are complicated when SHIELD is involved and it is revealed that the good Captain Britain has been working with SHIELD as part of its Euro division for a while now. 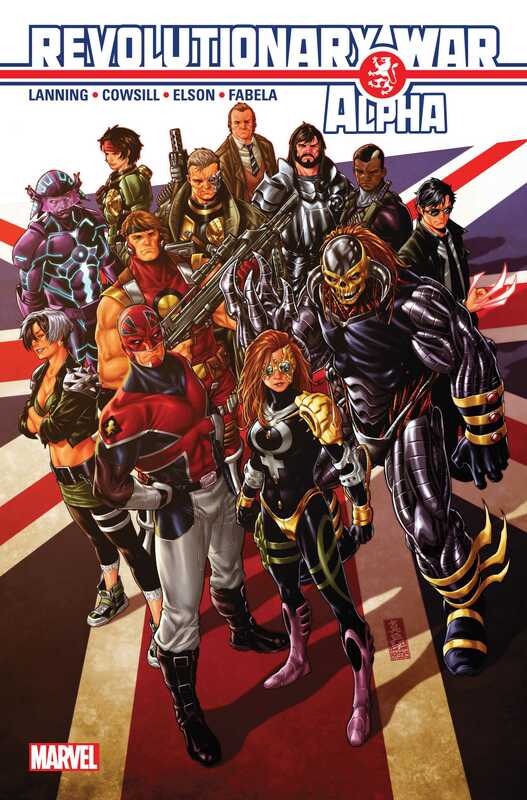 From there, we quickly go into recruitment mode as Agent Keller of SHIELD is assigned to work with Captain Britain and Agent Wisdom to bring back into the fold some key British heroes, especially all those who were there at the Battle of London Bridge where Mys-Tech was believed to have been defeated, some time back. I really liked the issue because of how different all these characters are from the regular superheroes I’ve been reading about for almost two years now. With fantastic names like Tigon Liger, Motormouth, Death’s Head, Dark Angel and more, this issue was an incredible read because of how fresh it feels to someone inundated with X-Men and Avengers characters across the board. That uniqueness has a lot of value and its fantastic to see that Marvel is experimenting with this. It also helps that Andy Lanning, one of UK’s top comics creators is working on this issue, alongside Alan Cowsill, another UK favourite, from what I can tell, trawling the internet for info. Their dialogue definitely reflects the British mentality and there are little things here and there that complete that entire atmosphere, and help establish that this is not something wholly different from what we are used to. Bringing in SHIELD serves to bridge Marvel UK with the rest of Marvel 616 and the current setting, so that’s even more valuable. What I’m interested in seeing is how Revolutionary War will stack up with Marvel’s Inhumanity event, given that its a worldwide event with worldwide consequences. Definitely something to look forward to. Sometimes the dialogue can seem a bit off, especially when the exposition gets out of hand as it does in the middle of the issue, and this can even affect the pacing, as it does in the second half with Captain Britain. Revolutionary War: Alpha #1 isn’t as tight an issue as I expected in terms of the writing, but I won’t complain since I’m quite impressed with it otherwise and with the whole unique factor of it. Rich Elson’s pencils, Antonio Fabela’s colours and VC’s Clayton Cowles’ letters are also all on point here. Each character stands out, even in splash pages featuring innumerable heroes and its easy to pick out all the details in the art again and again. Once again, the uniqueness is big here and while I’m not all that familiar with these characters, its fun to see who’s who, especially when they are referenced later on, whether visually or otherwise. The only drawback to the art is in a single panel early on when Captain Britain and Pete Wisdom meet with Fury. Combined with a slightly confusing dialogue bit, the panel didn’t quite work for me, but otherwise, this was a pretty solid issue. Overall, I’m quite excited to delve into these characters and I will definitely pick up the other titles to learn more about them and what they are going to be facing. Posted on January 11, 2014, in Comics Reviews, Review Central and tagged Alan Cowsill, Andy Lanning, Antonia Fabela, British Intelligence, British Superheroes, Captain Britain, Comics, Comics Review, Death's Head, Marvel, Marvel Comics, Marvel UK, Motormouth, Nick Fry, Pete Wisdom, Review, Review Central, Revolutinary War, Revolutinary War: Alpha, Rich Elson, SHIELD, Superheroes, VC's Clayton Cowles. Bookmark the permalink. 7 Comments.